A gorgeous, delicious and healthy soup that is easy to make and a perfect comfort food on cold days. 3. Add the spinach and vegetable stock. 4. Bring to a gentle boil and reduce flame. 5. Simmer for 5 to 10 minutes or until the spinach is tender. 7. Transfer to a blender and puree the mixture. 8. Pour this into a pan and place it over low-medium flame. 9. Add all the other ingredients and stir gently. 10. Simmer for 3 to 4 minutes or until the soup is heated through. 11. Garnish with a swirl of cream and serve warm. 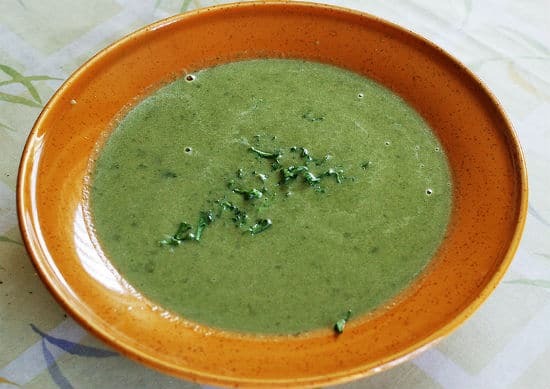 Feel free to comment or share your thoughts on this Cream of Spinach Soup Recipe from Awesome Cuisine.